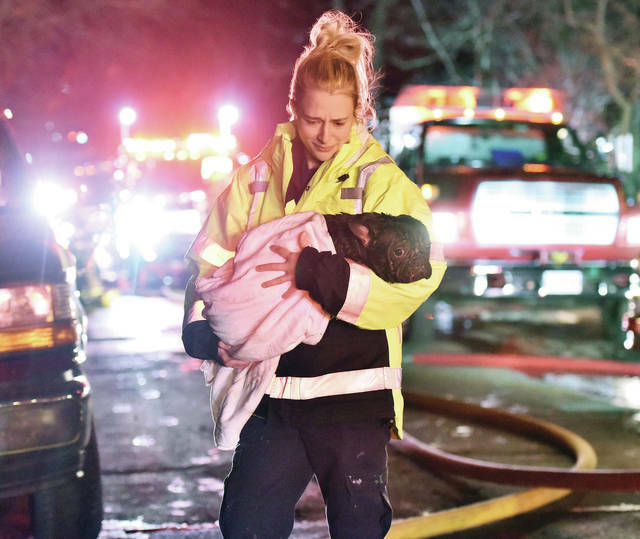 Perry Port Salem rescue EMT Kelsey Beam carries a wet dog away from a house fire at 223 N. Walnut Ave. in Sidney late Tuesday evening, March 26. Responding to the fire were the Sidney Fire Department, Botkins Fire Department, Anna Fire Department, Lockington Volunteer Fire Department and the Van Buren Fire Department. The fire took over an hour to fully extinguish. 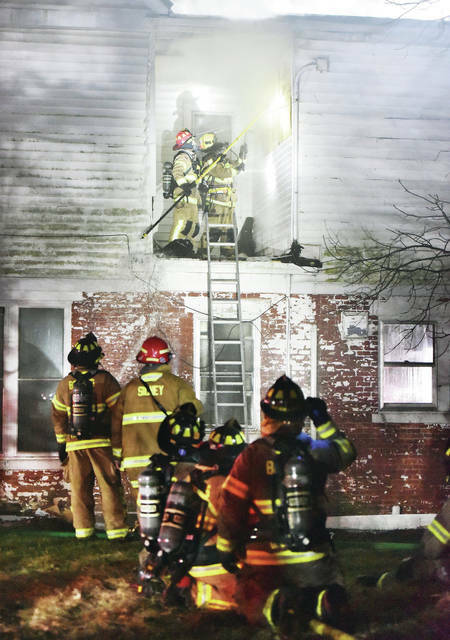 The alarm for the first fire at 106 N. Pomeroy was received at 9:40 p.m., while the second alarm for the fire at 223 N. Walnut Ave., was received at 10:23 p.m. Eighteen dogs were rescued from the Walnut Avenue residence. 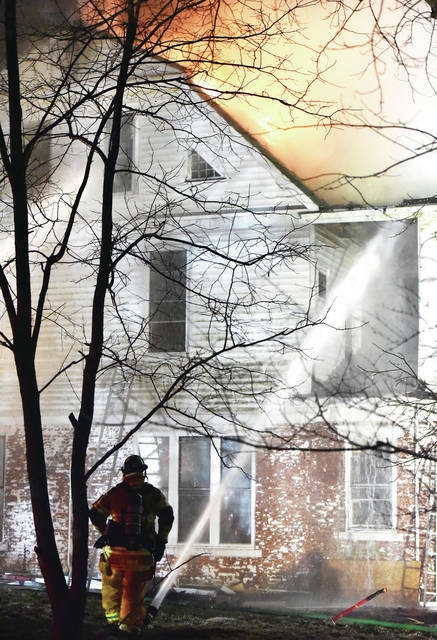 The large two-story, single-family residence on Walnut Avenue had a well-involved attic fire when firefighters arrived at the scene. Flames were shooting out of the attic/roof area. Sidney Police officers arrived on the scene and determined the residents were still in the house. They made contact with them and one officer asked about pets in the residence and was told there weren’t any, said Sgt. Josh Divens. 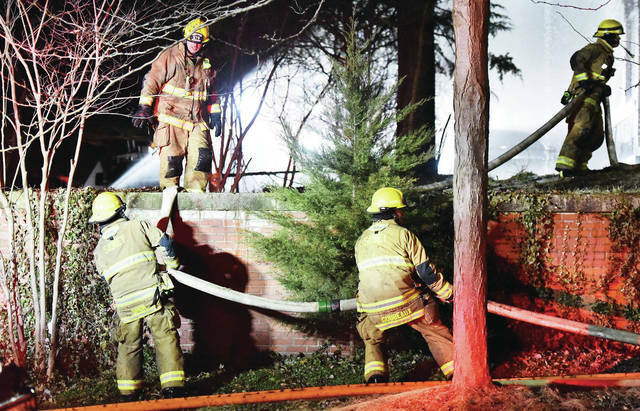 When Sidney firefighters arrived, they found heavy smoke and fire coming from roof of the structure. 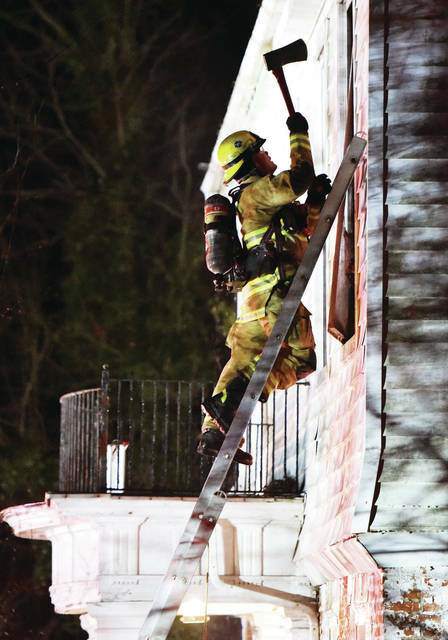 Firefighters battled the well involved attic fire for approximately three hours before it was brought under control. Extensive salvage and overhaul operations were completed to protect the property of the residents and to insure that no hidden fire remained. Vectren and DP&L were called to the scene to secure the utilities to the structure. 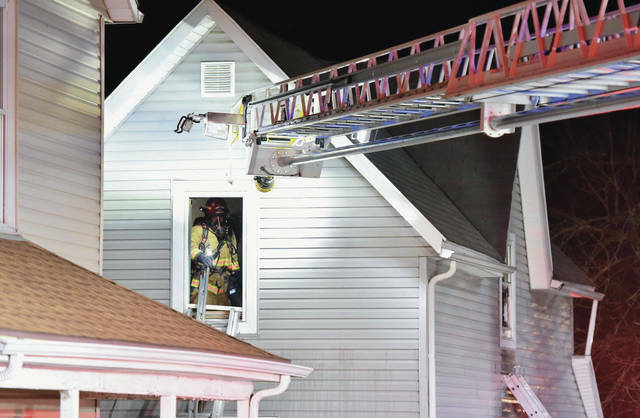 “Because the Walnut Avenue house was an older structure and it had some remodeling done to it, there were a lot of void spaces, which made finding the hidden fires more difficult,” said Hollinger. The home, owned by Hanna Grazyna, received fire, smoke and water damage throughout the structure. Damage was estimated at $167,000 to the structure and $50,000 to the contents. 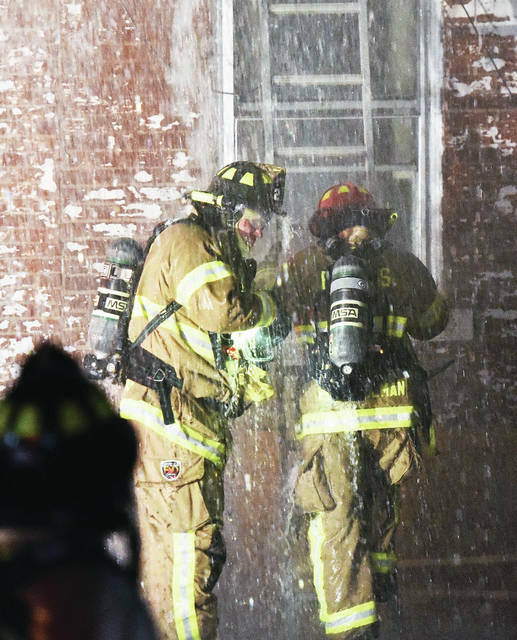 Firefighters were still on the scene at 7 a.m. on March 27. Red Cross was called to the scene to assist occupants Grazyna and Andrew Latocha IV with any immediate needs. There were no reported injuries to civilians or firefighters during the firefighting operations. Eighteen french bulldogs were removed from the Walnut Avenue residence and placed in the care of the Shelby County Animal Shelter. “The dogs are doing really good right now. We are keeping them separate from the other dogs (at the animal shelter). A vet came and saw the dogs and attended to them last night. The animals will stay (at the shelter) for now. We are not sure what will happen with them though until we figure it out with their owners,” Shelby County Chief Deputy Jim Frye said. 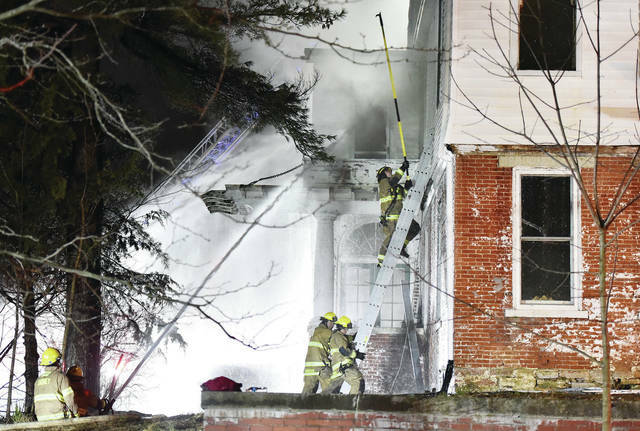 According to Hollinger, the fire at the Pomeroy residence has been ruled accidental. He said it appears the fire started after a candle was knocked over. The total loss to the property, owned by William Hughes, is estimated at $25,000 and to contents $5,000.